Here's a list of Practical Tips for Your Visit to Smith Island. Leave your paddling route with a friend or relative before you head out. 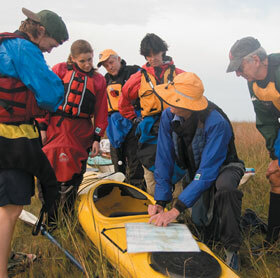 Paddle with a partner or a group. Always carry water when paddling. Seek local knowledge about weather, tides and currents. Tidal currents are modest but may make your route more difficult. Bring a spare paddle in case one is lost or breaks. Wear wading shoes and clothes that can get wet. Bring a change of clothes in a dry bag or heavy duty trash bag. When paddling at night or in dim light, carry a headlamp or flashlight. Never stand up in a canoe or kayak. Allow enough time to get off the water if summer thunderstorms are threatening. Operating watercraft while under the influence of alcohol or drugs is illegal. It is your responsibility to have the necessary skills, knowledge and equipment for a safe visit. For waterproof copies of the Smith Island Water Trails Paddlers Guide brochure, email Jim Rapp at dlitedirector@comcast.net, or visit www.delmarvalite.org.